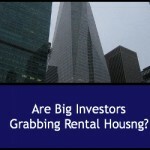 Are Mega Investors Grabbing All the Houses? Housing market headlines tell us it’s a good time to buy rental property, thanks to low interest rates and a hot rental market. But what if there aren’t enough houses for independent investors to buy? That’s the challenge facing hopeful investors in some US markets where large investment companies are buying up large packages of single family homes and small multiplexes – precisely the kinds of properties that individual investors are looking to buy. And that, according to a new article from REI Success Academy, could reate a shortage of rentals that leave those “little” investors out in the cold. Large investment companies’ practice of bulk-buying homes has been around a while. Banks and even government lenders Fannie Mae and Freddie Mac have gotten in on the act in the years since the great housing collapse of 2007-2009. That’s when millions of houses fell into foreclosure as a result of the unprecedented numbers of mortgage defaults that followed the bursting of the much-ballyhooed housing bubble. Foreclosures were being processed in such numbers (some fraudulently) that legal actions were backed up for years, which kept those houses off the market. Then, in a surge of activity, a large number of these houses hit the market at once. As the banks and government lenders took possession of these homes in unprecedented numbers, they looked for ways to get rid of them. With no hope of recovering the lost loans, they sold these properties in bulk lots to investing groups both foreign and domestic – many of them at private auctions that specifically excluded individual investors. These big groups, often backed by foreign banks and corporate capital, snapped up those foreclosed homes, put them into the hands of property managers, and rented them out at whatever prices the market would bear. The buyups come at a time when the number of available homes in certain markets continues to lag behind demand. Those lower interest rates and a modest upswing in economic conditions meant that more people were buying homes already on the market. But since 2012 or so, the balance has shifted. It’s a renter’s market now. Lending standards have tightened considerably after the scandals that accompanied the housing collapse. That, along with demographic shifts and other economic changes, means that in many markets around the country, renters now outnumber homebuyers. And because of the demand, rents are generally on the rise nationwide. That is good news for investors hoping to build wealth through rental property – which, as Jason Hartman says, is the smart way to create stable income from investments. But those very conditions have also opened the door for the mega- investors. One reason those big investing consortiums are snapping up single family homes and multiplexes is that those properties are considered “residential,” not commercial, units, such as multiplexes with five or more units or properties used for commercial as well as residential purposes. With secret auctions, massive amounts of backing and connections nationwide, the big investing groups may seem invincible. Can an independent investor hope to compete for the homes that are available in a given market? Like David in his Biblical battle with the giant Goliath, that “small” investor isn’t without options – and those options are clear in Jason Hartman’s advice: become educated, and be wiling to diversify. Researching the buying activity of those big groups can yield a profile of the kinds of homes and prices that they’re targeting. Armed with that information, the creative investor can shop for potential properties outside the “purchase zone” of the big investors. If they’re buying homes in certain neighborhoods and in a median price range, for example, it might be time to look at lower priced properties, or ones with different characteristics. Diversifying the portfolio is key to success in rental real estate. If there’s a shortage of potential investment properties in one area, that might not be true in another. And wise investors are willing to become “area agnostics” who look for the best opportunities in as many places as possible as a hedge against a collapse in any one area. Childress, Zack. “Rental Housing Could Be Running Out.” REI Success Academy. rei.com. 8 Oct 2014.